Greig Clifford - A UK based Music Photographer. Home. Thanks for taking the time to visit. If you are unfamiliar with my name, it is said as "Greg". There are three areas of photography I'm mostly involved with... promotional portraiture of bands and artists, live music photography, and creative photographic image making in general. I've designed this website to be informative so there's quite a lot of blurb about how I like to do things. Apologies if you're only here to see photos. I'm often asked about my gear (old! ), my rates (very competitive! ), what to expect from a shoot (relaxed, cheerful and professional), and questions about "rights and usage" (fair!)... Click the "info / faq" section above for all the details, and more. 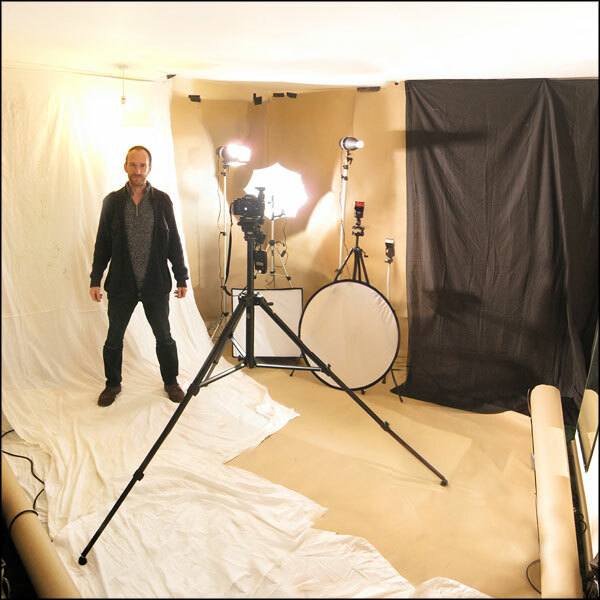 The photo above shows me in my own personal studio setup near Littlehampton on the South Coast, UK (about 20 miles from Brighton), ideal for portraiture of bands and individuals in an informal home environment. Of course, I'm comfortable working in any studio, or on location. I usually work between London and Brighton but I'm happy to travel further afield, even abroad. I'm keen to do more headshot/portrait work with actors/actresses and I'm always looking to make new contacts with bands, management, labels and publications (print and/or online). If you like what you see, feel free to get in touch using the details at the top of the page. Thank you!